In an FT piece titled “What the left can learn from Steve Bannon,” Tett writes that “the American media these days tend to be tribal” and “if Bannon’s critics want to fight back, they badly need to get out of their cocoon, and start clicking on to Breitbart News” and other conservative media outlets. It is a thought-provoking image to ponder, as the Republican party — not to mention the rest of the world — tries to work out what Bannon will do next. 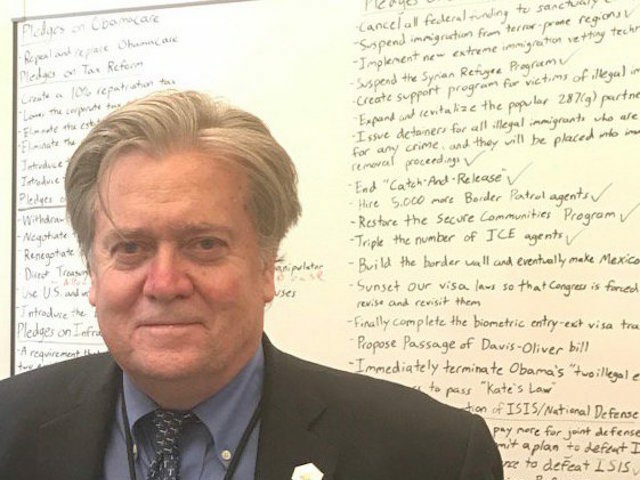 During my two decades as a journalist, I have covered many political and economic systems around the world, and Bannon is one of the most fascinating figures I’ve met. Never mind the fact that he is whip-smart and widely read, what is also striking is that he seems to have a quasi-anthropological understanding of the power of symbols and ways of defining identity, which he manipulates to advance his goals. “And I admire the fact that he has a clear sense of strategy and wants to watch and analyse the entire ecosystem, even if parts of it, such as CNN, represent everything he loathes,” she writes. In her piece, though, Tett reveals that she may also need to keep up a bit more with what is going on on the right because she buys into the false “alt-right” spin/smear when acknowledging that she respects Bannon, who she notes is not “going quietly,” even though she recoils “with horror from the alt-right movement and its racist ideology.” As a Harvard/MIT study found, as reported in a New York Times cover story, Breitbart News is “not alt-right.” Bannon has also explicitly said on numerous occasions, most recently in the American Prospect interview Tett references, that he rejects ethno-nationalists and white supremacists. Bannon has described himself as an economic nationalist whose America-first views on issues like the economy, trade, and immigration (many legal immigrants, for instance, do not want massive increases in high-tech guest-worker visas for the tech industry) appeal to U.S-born Americans and legal immigrants of all backgrounds. Tett also says she was not surprised in the least when Bannon spoke to the American Prospect‘s Robert Kuttner and told FT reporters that he loved reading the Financial Times. Tett’s observation about Bannon is why I was dumbfounded, shocked, and astounded when Axios reporter Jonathan Swan inadvertently revealed that some of his top-level White House sources had never heard of The American Prospect before. Do Swan’s sources know about the Washington Monthly? Legacy media reporters who do not regularly read Breitbart News may not know that Breitbart News has analyzed the left and Democrats better than most of their conventional reporters and “Republican” and right-of-center pundits they go to for their “analysis.” At the very least, Breitbart News has understood the left and Democrats better than the legacy media and left-of-center reporters have analyzed Breitbart News, economic nationalists, and the right. Vicky Ward, the HuffPost editor-at-large and author of the very compelling Devil’s Casino book, agreed with Tett on the lessons the left can learn from Bannon and Breitbart News.